I was chatting with Jane May earlier tonight about how it seems that in our four short months of blogging so far, we have already seen many blogs come and go. Why is that most bloggers give up after a few short months? According to a recent article on Pronet, the blogosphere is standing still. 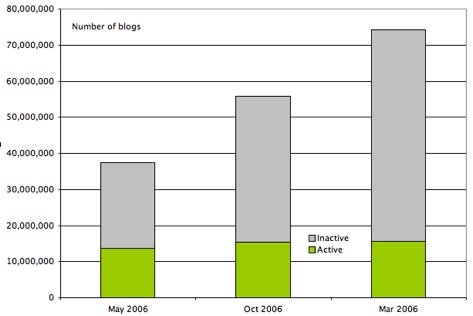 Even though the number of blogs created in this past year has increased by more than 30 million, the number of active blogs continues to stand still at around 15 million, excluding quasi-blogs, such as Myspace. So, why is it that most blogs get abandoned sooner or later? I present to you the top five reasons why most blogs don’t last. Hopefully baby bloggers will keep some of these points in mind over the next few months. 1. Blogging consistently is not easy. It certaintly is easy to set up a Blogspot account or even install WordPress, but unfortunately, most blogs don’t go much farther than that. Many people find that writing informative and original articles consistently is difficult, and they are right – it is difficult. However, most experienced bloggers will tell you – it takes a while to build up that elusive blogging rhythm – the one in which you easily weave together insightful and unique posts. 2. New blogs see little to no financial return. Many people start blogging because they see John Chow and Problogger pulling thousands each month from Adsense. These superbloggers make it look easy too, but the fact remains, John Chow and Darren have been blogging for YEARS. They are basically the grandfathers of the blogosphere. I didn’t make more than $20 my first 2 months of blogging, and now in my fourth month, I am JUST beginning to see financial returns. 3. Traffic takes time to build. I’ll admit it – it’s hard to feel motivated to blog when you know not many people are reading your work. However, this early stage of blogging is arguably the most crucial. The first three months are the time to show everyone, that despite not having tons of comments or a large number of RSS subscribers, you write awesome, original, link-worthy articles. 4. No passion for their blog topic. Many new “make money online” blogs have popped up over the past few months. That being said, how many of those people actually make money online and are passionate about it? John Chow didn’t start writing only about how to make money online – he initially just used his blog to talk about his passions, only one of which was making that online dough. My passions are business and web development, and only since I have been blogging has my passion for blog development emerged. Now, blog development is one of my favorite topics to write about. 5. Time management must be practiced seriously. It’s no secret – most people would love to quit their day job and blog full time. So, they start blogging, but find that, like anything, it takes a decent amount of time. Add that to their already busy lives and it is something that gets put off and eventually abandoned. When anyone adds blogging to their busy life, they must start practicing time management more seriously. I find that it doesn’t take me much longer than 20-40 minutes to write a solid post, so I make sure to carve out that time at least 5x per week. Just like going to the gym, blogging takes months of hard work to see any noticeable benefits. In my four months of blogging, only recently am I starting to see these benefits – including financial return, people linking to my posts, and a decent number of subscribers, readers, etc. In conclusion, this is the number one lesson I have learned from blogging – hard work over time pays off. With time, comes experience and respect. I respect people that have been blogging for at least six months – that takes some serious dedication. The longer you have been blogging, the more people will see you as an expert or authority about your blog topics. There is a lot of power in published work. Blogging has taught me that to see measurable results in ANYTHING, you must work hard, stay ultra-dedicated, and perhaps most importantly, be patient. Treat blogging like going to the gym, but don’t forget to go to the gym too! How long have you been blogging? Please respond to my poll – on the sidebar, to the right. Tomorrow, I am going to talk about how blogging has changed my life. I just want you to know that I’m on my fourth month of blogging and that I had passed what you termed as the first critical three months wherein most bloggers stopped blogging altogether. I know this is but a fraction of what you meant. I just want to reassure you that the inspiration I’ve taken from reading your posts stays with me. It’s essential for me to keep this alive. you said that ” New blogs see little to no financial return.” The funds are so new that there’s no five-year data then. I like your point “Traffic takes time to build” any kind of site like blogs, forums ……. etc required some time to build traffic. Previous Previous post: Want to Work for Google?